With summer officially here I thought it would be nice to share some tips for grilling. Nothing says summer to me like grilling and relaxing by the pool. Rebecca and I love experimenting on the grill, seeing what works and what doesn't. Two of our favorite things to cook are burgers and corn on the cob. When it comes to gas or charcoal, I am a traditionalist and prefer with charcoal. I love the taste and the challenge of maintaining a proper temperature on a charcoal grill. Recently I even started smoking my meat on a Weber kettle grill even though it is not designed for it. Whichever type of grill you choose to use hopefully these tips will help. With a gas grill, it’s a lot like a gas stove – turn on the gas and light it. Most gas grills even have temperature settings so there’s no guesswork. Charcoal’s a little trickier, but doable if you know the secrets. For one pound of meat cooked with the direct-heat method (smack over the fire), a good rule of thumb is 30 briquettes. For the same amount of meat using slower indirect heat, you’ll need about 50 briquettes. There are many ways to light a fire. Some use an electric heat element, some use lighter fluid, some use a charcoal chimney. Some even use gasoline, but we don’t recommend that (one guy lit a tree on fire in a Texas national park). If you inherited your grill and have no instructions, here’s a time-honored method to determine temperature: hold your hand palm down over the fire about six inches above the coals. Count in seconds how long you can comfortably hold your hand there: 5 mississippis: 200-300 degrees Fahrenheit; 4 mississippis: 300-350 degrees; 3 mississippis: 350-375 degrees; 2 mississippis: 375 and above. If you are like me and don't like cooking your hand to find the temp, you can buy a grill thermometer from a hardware store or online and install it yourself. - Remove and properly dispose of grill ashes as soon as they cool down. When mixed with water, ashes can eat through metal. - Arrange food at least ¾ “ apart for even cooking. - Keep children and pets away from the grill when it’s in use. - Set up your grill on a flat even surface. 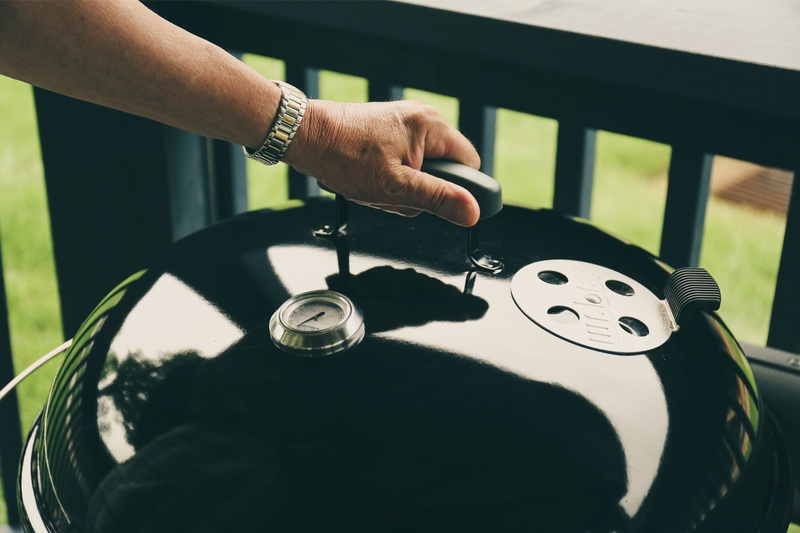 - For gas grills, don’t store extra gas tanks under or near the grill. - Don’t wear loose, flowing clothing when working with fire. - Use nonstick cooking spray on grill racks, but don’t spray it over the fire, which can cause flare-ups. - To prevent charring, which adds carcinogens to your food, trim excess fat, put on sauces near the end of cooking time, use the higher racks of your grill and keep your grill clean and well-oiled. If you have any other questions about grilling feel free to give me a call, or do what I do and Youtube it. Grilling is a science and an art, so don't get discouraged if you burn a couple burgers or have to put the steak back on the grill cause its a little colder than rare. Once you figure it out is a rewarding experience and will quickly become a regular part of your cooking arsenal.